Aimee Senior is not used to this. Richard Stephens/Special to the Pahrump Valley Times Beatty senior Andrea Leon goes up for 2 of her 8 points during the Hornets' loss to Word of Life on Jan. 29 in Beatty. Richard Stephens/Special to the Pahrump Valley Times Sophomore Carmen Stevenson scored 8 points Jan. 29 as the Beatty High School girls basketball team fell to Word of Life in a Class 1A Southern League game in Beatty. 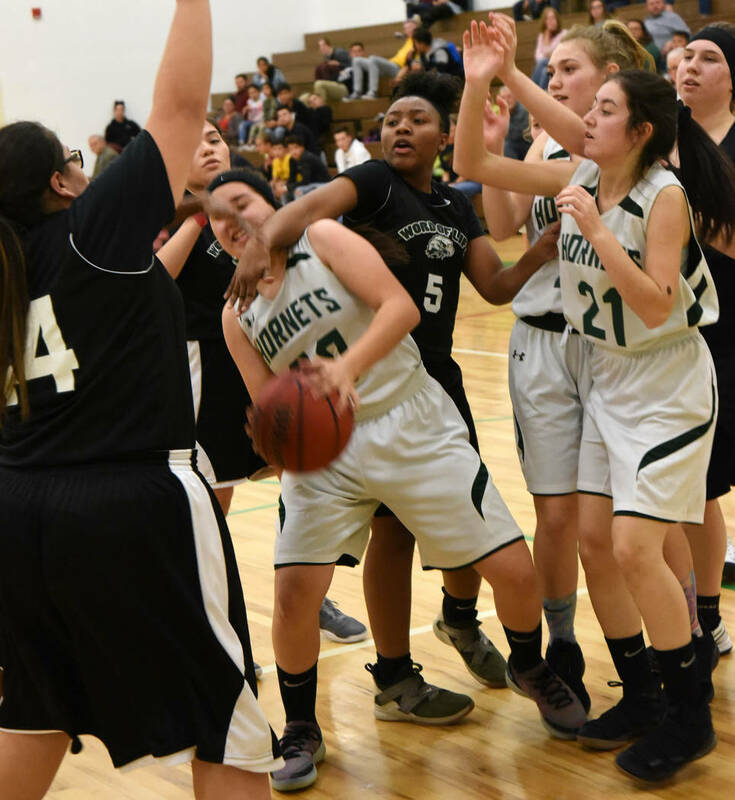 Richard Stephens/Special to the Pahrump Valley Times Beatty sophomore Marlene Damian wins a battle for possession during the Hornets' game against Word of Life on Jan. 29 in Beatty. Richard Stephens/Special to the Pahrump Valley Times Beatty sophomore Kyleigh King drives to the basket Jan. 29 against Word of Life. King finished with 5 points as the Eagles defeated the Hornets 43-34. Before last season’s 2-9 campaign, the Beatty High School girls basketball coach had not had a losing season since 2008-09, and that was 10-12. Since then, the Hornets have had records such as 17-9, 11-5, 14-7, 13-7 and 12-7 until last year’s disaster. This year looks worse. Much worse. The numbers aren’t pretty. The Hornets held Indian Springs to 22 points. And lost. They held Beaver Dam to 20 points. And lost. Six times this season they have failed to score 20 points. They have lost by 27, 40, 41 and 30 points on their way to a 1-9 record, 0-5 in the Class 1A Southern League. 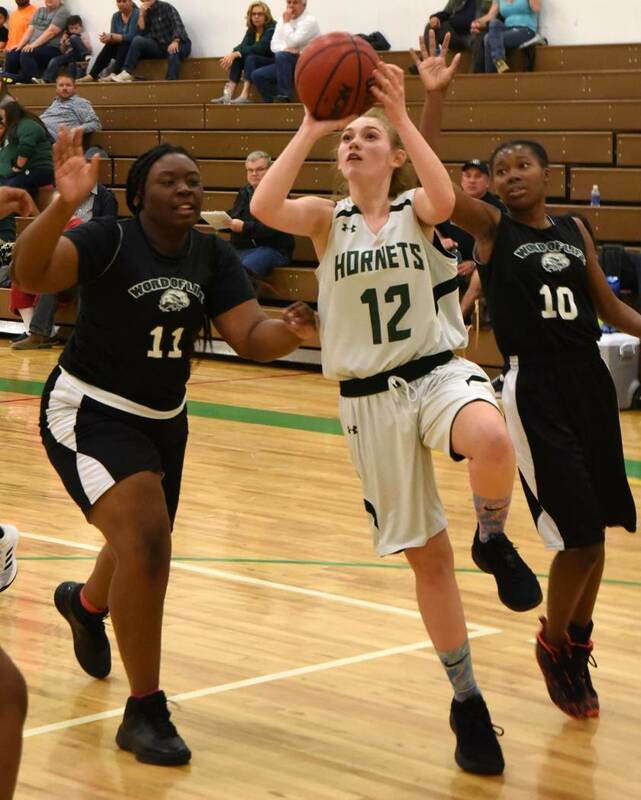 But last week, at home against Word of Life, the young Hornets gave Senior a glimpse of what could be in the future for Beatty girls basketball despite the 43-34 defeat. It started in pretty hideous fashion. Not only did they end the first quarter trailing the Eagles 19-4, the Eagles didn’t play particularly well to build that lead. The Hornets were in a generous mood, and sometimes it was tough to watch. There was held ball after held ball, so many that three times the person handling the possession indicator fell behind. An easy rebound off of an air ball went off a player’s hands out of bounds. A misplayed pass smacked a player in the face and sent her eyeglasses flying. “They don’t really have that sense of basketball yet,” Senior acknowledged after the game. But did they get discouraged? Did they pack it in? Did they tune out Senior and get blown out of the gym? No, no and no. This young team — the roster lists one senior, two juniors, six sophomores and two freshmen — started to figure it out. Not that anyone turned into Rebecca Lobo or anything, but they played smart basketball and turned a blowout into a competitive game. The change started late in the second quarter after Word of Life built the lead to 25-4. 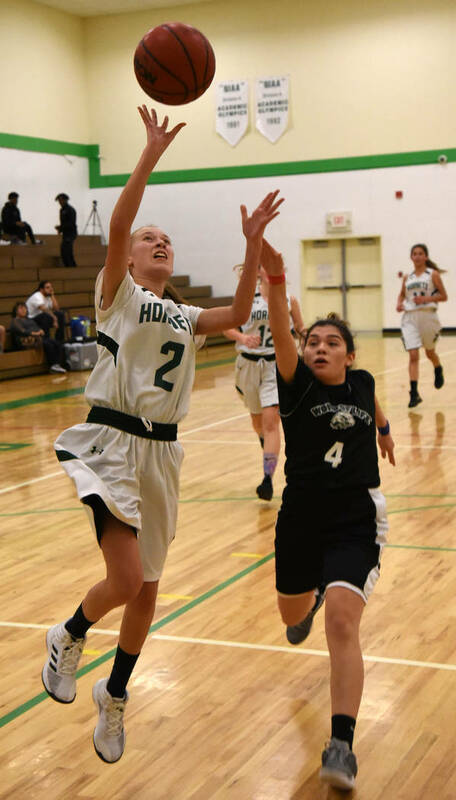 Sophomore Carmen Stevenson’s bank shot from about 6 feet away started an impressive 13-0 run capped by 8 consecutive points from their lone senior, Andrea Leon. By halftime it was 25-17. “They were hustling tonight,” Senior said. While the Eagles got back on track in the third, the Hornets didn’t go away. They were outscored 9-6 in the period, but the every basket showed some basketball brains. Sophomore Marlene Damian scored an easy layup off of an inbound pass. 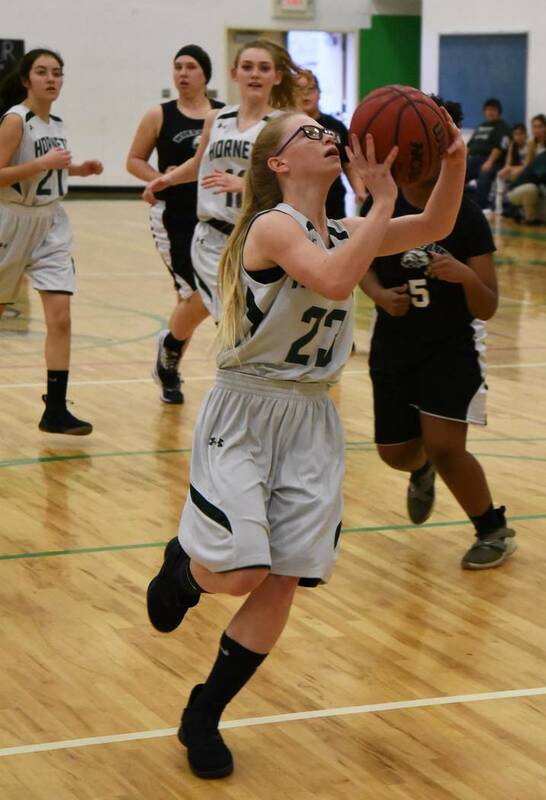 Sophomore Kyleigh King somehow managed to adjust her glasses while driving to the basket and made the shot. And Stevenson had a nice drive for a layup. Simple things, perhaps. But when three of your 10th-graders overcome a rough start — King was the one who got smacked in the face with the basketball, and more than once — to go tooth-and-nail with a more experienced team (Word of Life features seven juniors and seniors), you think of the future. And when the Eagles pulled away late to build an 18-point lead in the fourth quarter, the Hornets kept battling, scoring the game’s last 9 points. Damian hit a layup, sophomore DeDe Salasar was fouled on a 3-pointer in the corner and sank all three free throws, King converted a layup ahead of the field, and Salasar nailed an 18-footer. Small victories, but they showed they are developing skills while displaying the fight to get back into a game they trailed by 15 before some people were in their seats. “Tonight’s the first time probably all season they pulled it together,” Senior said. “They worked hard and played well, and I was really proud of them. Leon and Stevenson each finished with 8 points, while Salasar totaled 7. Also getting into the scoring column were King with 5, Damian with 4 and freshman Ana Torres with 2. But it was also another defeat in a season full of them, and Senior sometimes has to play psychologist. Three days later, there was little to cheer in a 47-17 loss to Green Valley Christian, and next up is a Tonopah team that hammered them 46-19 in their opener Dec. 4. But then comes Sandy Valley. If the winless Sidewinders lose today at Beaver Dam, they will bring an identical 0-5 league record to Beatty next Friday. One thing is for sure: The Hornets will work hard that night, and maybe show Senior a few more signs that things are starting to come together.